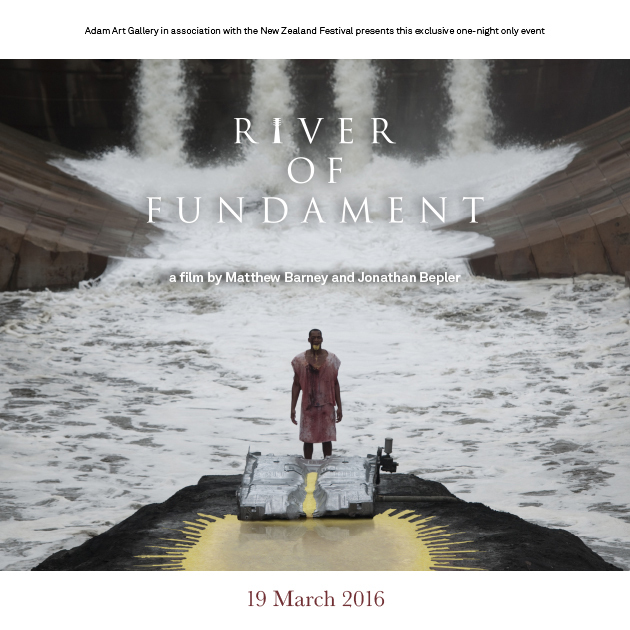 The Adam Art Gallery in association with the 2016 New Zealand Festival was pleased to present the exclusive New Zealand premiere of River of Fundament, New York-based artist Matthew Barney’s latest and most ambitious project to date. Developed over seven years with composer Jonathan Bepler, Barney’s long-time collaborator, River of Fundament is an epic six-hour cinematic adaptation of the late author Norman Mailer’s 1983 novel, Ancient Evenings. The project was conceived as a non-traditional opera and comprised three live performances in Los Angeles, Detroit and New York City. The film, River of Fundament, combines footage of these performances with narrative cinema and an innovative musical score to radically retell a complex mythological tale of a protagonist’s ultimately failed attempt to achieve immortality. Barney and Bepler place Norman Mailer as the protagonist in his own narrative. Through three incarnations he visits his own wake, which is attended by Mailer’s literary peers in the setting of his Brooklyn Heights apartment. In a parallel narrative, the protagonist is the American automobile, which is likewise reincarnated, in this case by means of modern industral processes of manufacture and recycling. In each narrative, the protagonist endures the many stages and brutal challenges of regeneration that accompany attempts to ascend to higher, more powerful states. The narrative is intensified by the use of characters from Egyptian mythology and Barney’s previous film, Cremaster 3, along with a multitude of mesmerising musical performances. Employing a mix of traditional and experimental musical forms involving voice, percussion, strings, horns, handmade instruments, and ambient sound, the score is an essential component of the dialogue and narration, whilst also reflecting each site’s history and character. River of Fundament features performances by actors Maggie Gyllenhaal, Paul Giamatti, Elaine Stritch, Ellen Burstyn, Aimee Mullins, and a cast of hundreds of locally sourced extras. Musicians and singers include Joan La Barbara, Milford Graves, Lila Downs, Belita Woods, Herbert and Eugene Perry, and numerous others. River of Fundament combines elements of cinema, live action, sculpture, and musical performance in an intense, highly complex, sometimes shocking mix. This is a film to be experienced. River of Fundament was presented as a one-night-only gala screening in Wellington’s historic Embassy Theatre, at 6pm on Saturday 19 March 2016. For more information visit the River of Fundament website. This exclusive screening was organised in association with the 2016 New Zealand Festival.